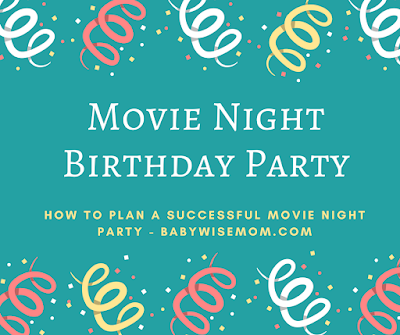 A movie night birthday party is really quite simple to do, and it is something kids get really excited about. At young ages, they don’t often get to stay up “late” with friends watching a movie. 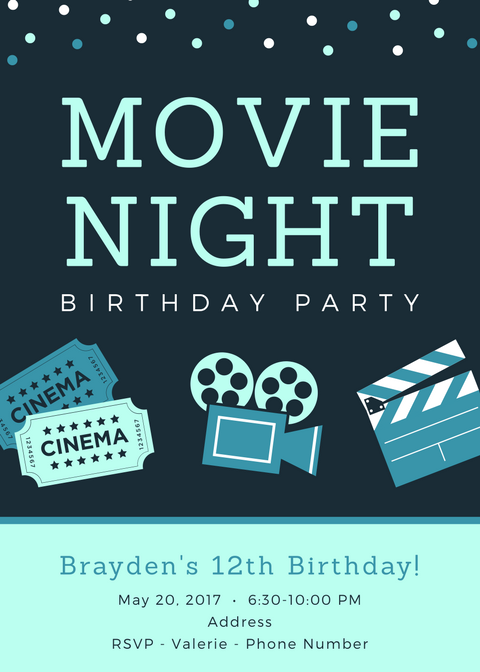 Both Brayden (turning 12) and Kaitlyn (turning 10) chose to do a movie night birthday party this year. 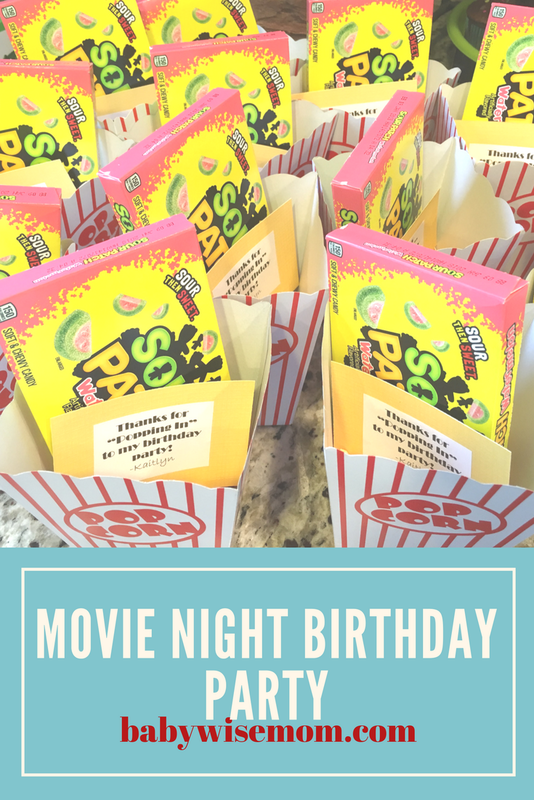 Here is how to throw your own movie night party. This post contains affiliate links. One of the first things to do is to make the guest list and create invitations. Give your child the limit on number of friends he can invite. Make sure you have enough seating for your movie with your guests. Kids don’t mind squishing and don’t seem to need to be super comfortable, but they still need space. One note, over the years, I have found kids love parties. They rarely, rarely miss a party. One of my friends once doubled the number of children she hoped to end up with, which is perfectly wise because that is what you do for baby showers, bridal showers, weddings, etc. You are told to invite twice as many as you want. Not so with birthday parties. Children will come. I have been loving using Canva.com for invitations. You can find invitations for free. Some cost a little money. Kaitlyn’s cost me $1 and Brayden’s was free. They have several movie layouts, so definitely check them out! You will also want to choose what movie you will be watching early on. Most parents of elementary students are careful about what their children watch, and they will want to know what you are watching. You might even include it on the invitation. You will also want time to get the movie if you will be watching one you don’t own. Another reason to decide early on is so you can know the run-time of your movie. Movies can vary greatly in length. If you are watching a 2 hour long movie, you might start your party earlier than you would for a 1.5 hour long movie. If you are having a party with boys, the food will be one of the most important elements of the party. Boys care more about this than anything. We always have endless supply of popcorn for our movie nights, birthday party or not. We pop it with an air-popper usually, though for Brayden’s we did have a giant bag of pre-popped popcorn. That was much easier for a birthday party. It was hard to keep up with the popcorn wants for Kaitlyn’s party. For the parties this year, we got these fun popcorn boxes for the popcorn and the kids thought that was fun. It is also fun to have something sweet. You can buy the movie theater boxes of candy from WalMart for around $1 each. You can order packs of them from Amazon often that are cheaper than buying them individually. We have baked cookies and we have also done chocolates in a chocolate mold. With a birthday party, we do cake and ice cream, so we usually only do the popcorn and don’t worry about the sweet. We eat the cake and ice cream just before the movie starts. I figure that is enough sugar! You will also want some sort of drink. We are all basically water drinkers at our house, so that is usually what we do. An easy thing to do is to have a jug of water and cups with their names on them so they keep them straight. For the party, you don’t want to start right out with the movie. 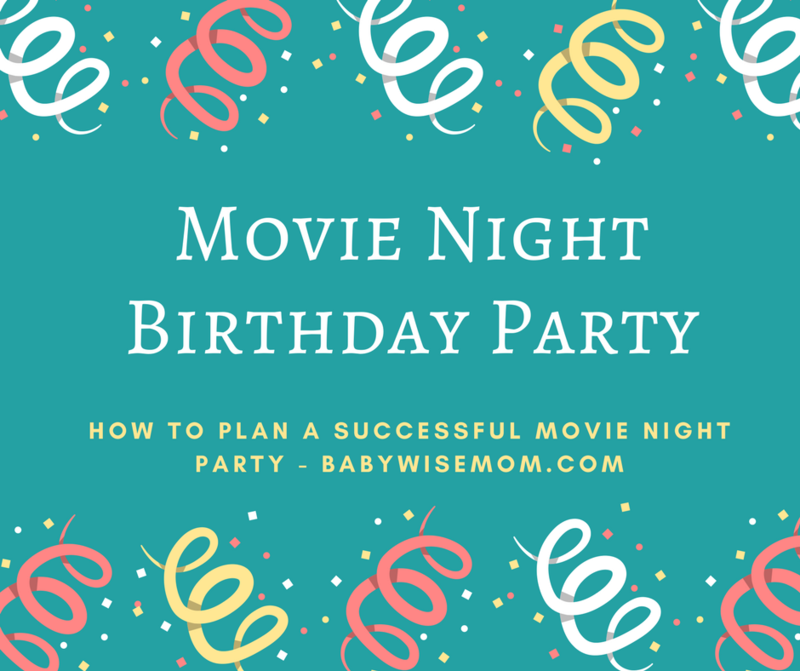 No matter if we are having a birthday party or just a late-night with a movie, we start the party 1-1.5 hours before we need to start the movie. This gives the kids time to interact and get the wiggle out before the movie starts. We let this be pretty flexible. We have party board games ready to go if needed. We have the backyard to play in. We let the kids drive the activity, and I consistently find they want time to run around the yard and be crazy before settling in for a movie. The older they are, the less structure they want at this point and the more they want opportunity to talk (even boys. Weird). One note, we count back from the end of the party to figure out how long we have for games. I like to end at 10. We then move back how long we need to for the movie they will be watching (Brayden’s was 2 hour and 5 minutes, so we planned to start the movie at 7:50). Then we add 30 minutes total for cake and ice cream and presents. So then we know how long we have available for games. I like to give a “thank-you” at the end of the party. This has traditionally been a “party favor,” but instead of calling it that, I am now calling it a “thank you.” I like that it puts my kids in the frame of mind to be thankful their friends came. 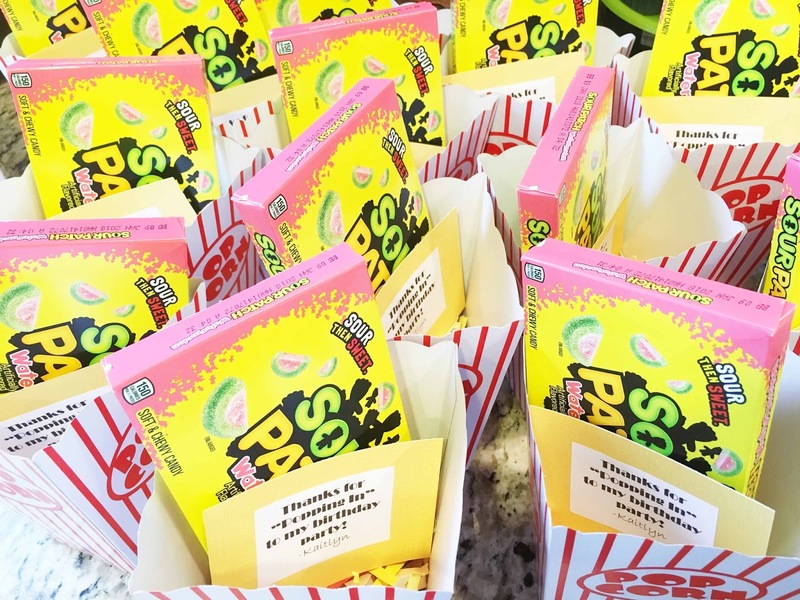 For the movie night, I got more of the popcorn boxes and a case of Sour Patch Kids from Amazon (you could, again, go to Walmart for movie theater size candy boxes instead. I like to shop on Amazon for convenience. Also, the popcorn boxes are an “add-on” item, so you have to spend so much to get the add on item. It was just easier to do everything in one transaction on Amazon). We shredded some yellow paper to go in the bottom of the box and made some “thank-you” cards. 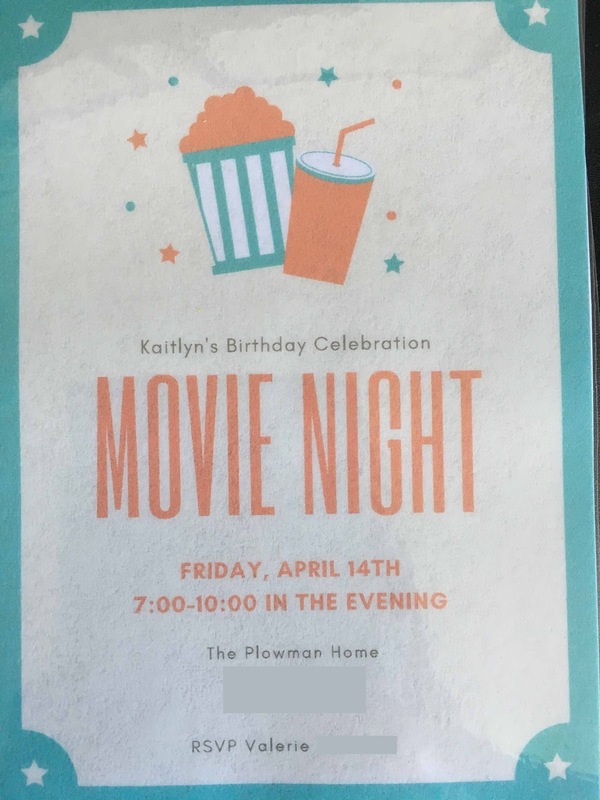 Kaitlyn handed these to her friends as they left her party. For Brayden’s party, I actually didn’t even go this far. I had all the stuff for it, but May is the craziest month of the year around here, and his birthday party was in the hands-down busiest week of the year for us. The day of the party, I realized boys don’t care about cute. The girls notice it and appreciate it. 99% of boys take no notice. At all. Brayden handed out the boxes to his friends right at the beginning of the movie and said “Thanks for coming to my party.” It worked out very well. Great ideas. Just curious which movies you showed? Holly we did the Princess Bride for Kaitlyn's party. Brayden did The Empire Strikes Back. The Princess Bride is a great movie, but there are a couple of parts I was like "ack!" There are a couple of swear words. So if you choose an older movie that is PG, be sure you watch it first (or just assume there is swearing because that seemed to be true of the 80s). We also considered Moana for Kaitlyn or Sing–choosing something that has recently come out and is popular is a great idea, especially because you will have recently seen it. The Lego Movie is another fun one. Good tips and movie ideas. Thanks.